is an excellent book by Peter Wohlleben (isbn 1771642483). As usual I'm going to quote from a few pages. In forked trees, at a certain point, two main shoots form, they continue to grow alongside each other. Each side of the fork creates its own crown, so in a heavy wind, both sides sway back and forth in different directions, putting a great strain on the trunk where the two parted company. ... The fork always breaks at its narrowest point, where the two sides diverge. The process of learning stability is triggered by painful micro-tears that occur when the trees bend way over in the wind, first in one direction and then in the other. Wherever it hurts, that's where the tree must strengthen its support structure. ... 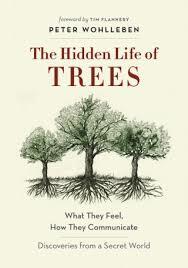 The thickness and stability of the trunk, therefore, builds up as the tree responds to a series of aches and pains. There is a honey fungus in Switzerland that covers almost 120 acres and is about a thousand years old. Another in Oregon is estimated to be 2,400 years old, extends for 2,000 acres, and weighs 660 tons. That makes fungi the largest known living organism in the world. You find twice the amount of life-giving nitrogen and phosphorus in plants that cooperate with fungal partners than in plants that tap the soil with the roots alone. Diversity provides security for ancient forests. There are more life-forms in a handful of forest soil than there are people on the planet. As foresters like to say, the forest creates its own ideal habitat. Commercial forest monocultures also encourage the mass reproduction of butterflies and moths, such as nun moths and pine loopers. What usually happens is that viral illnesses crop up towards the end of the cycle and populations crash. The storms pummel mature trunks with forces equivalent to a weight of approximately 220 tons. Any tree unprepared for the onslaught can't withstand the pressure and falls over. But deciduous trees are well prepared. To be more aerodynamic they cast off all their solar panels. And so a huge surface area of 1,200 square yards disappears and sinks to the forest floor. This is the equivalent of a sailboat with a 130-foot mast dropping a 100-by-130 foot mainsail. Why do tree grow into pipes in the first place?... What was attracting them was loose soil that had not been fully compacted after construction. Here the roots found room to breathe and grow. It was only incidentally that they penetrated the seals between individual sections of pipe and eventually ran riot inside them. Sometimes, especially in cold winters, the old wounds can act up again. Then a crack like a rifle shot echoes through the forest and the trunk splits open along the old injury. This is caused by differences in tension in the frozen wood, because the wood in trees with a history of injury varies greatly in density.